Contents: Preface. T. Hadjistavropoulos, K.D. Craig, An Introduction to Pain: Psychological Perspectives. R. Melzack, J. Katz, The Gate Control Theory: Reaching for the Brain. G.J.G. Asmundson, K.D. Wright, Biopsychosocial Approaches to Pain. C.R. Chapman, Pain Perception, Affective Mechanisms, and Conscious Experience. T. Hadjistavropoulos, K.D. Craig, S. Fuchs-Lacelle, Social Influences and the Communication of Pain. S.J. Gibson, C.T. Chambers, Pain Over the Life Span: A Developmental Perspective. G.B. Rollman, Ethnocultural Variations in the Experience of Pain. S.M. Skevington, V.L. Mason, Social Influences on Individual Differences in Responding to Pain. D.C. Turk, E.S. Monarch, A.D. Williams, Assessment of Chronic Pain Sufferers. S. Bruehl, O.Y. Chung, Psychological Interventions for Acute Pain. H.D. Hadjistavropoulos, A.C. de C. Williams, Psychological Interventions and Chronic Pain. K.D. 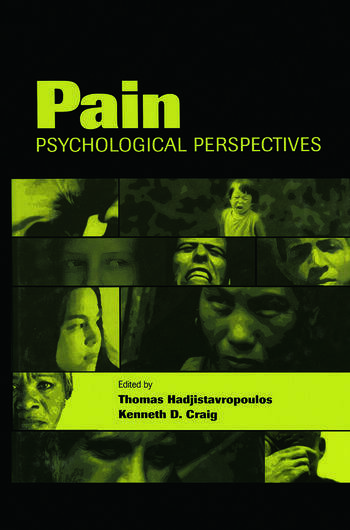 Craig, T. Hadjistavropoulos, Psychological Perspectives on Pain: Controversies. T. Hadjistavropoulos, Ethics for Psychologists Who Treat, Assess, and/or Study Pain.